The Lion House, which is in a village near Saratov, organizes volunteer and charity events as well as master classes for children from orphanages and for local residents. In 2009, deep in the countryside of Russia’s Volga heartland, a group of students from Saratov State University on a folklore expedition discovered an extraordinary house in the village of Popovka. The students were amazed by the painted interiors of the wooden peasant dwelling: Its walls, ceiling and floor were covered with paintings of a smiling lion, St George's face, cherubs, and a shepherd with geese. The photographs the students came back with persuaded folklore scholars to conclude that the house was a unique phenomenon. Five years – and a lot of hard work – down the line, the Lion House, as it was dubbed, has been turned into a private museum by Yulia Terekhova, a culturologist from St. Petersburg. Under the name of The Lion House Museum of National Monumental Paintings, the museum organizers volunteer and charity events as well as master classes for children from orphanages and for local residents. Any person who wishes can hold a cultural event of their own here, with the agreement of the owners. "In fact, our museum has not been registered officially. According to the papers, this house and its grounds are my private property,” says Terekhova. “Everything here is free. Visitors do not see this house as a museum. They just come here, visit master classes, help with something; this is what people need. After all, it does not really matter what we are registered as; what matters is what we do." The house first came to the notice of Terekhova, an art expert, restorer and culture manager, when she spotted a newspaper article about the unusual discovery in the Saratov Region. In 2010, having visited the house, Terekhova decided to buy it and turn it into an art venue open to visitors. Moreover, it turned out that the owners wanted to pull the house down and build a bathhouse out of the remaining materials, soit became a matter of saving a cultural monument. The price of nearly $3,000 that the owners asked was a lot of money for Terekhova, but thanks to her friends, she managed to find the money. So in 2011 the Lion House museum was set up. "Originally, I thought of transporting the house to an open-air museum. However, it turned out that the move may damage the paintings,” says Terekhova. “Besides, gradually I realized that, like any monument, the Lion House should be perceived in the context of the cultural environment where it emerged. That is why I decided to leave everything as it is," she explains. These days, the Lion House is now an object of pilgrimage for visitors from different parts of Russia. According to Terekhova, visitors have an opportunity not only to see a monumental painting site and become part of a unique cultural environment but also become creators of their own socio-cultural space. Since 2011, the museum has served as a base for camps staffed by volunteers from Moscow, St. Petersburg, Saratov and other cities. Volunteers help with various work that needs to be done in and around the house, and take part in events and festivals. "As a restorer, I understand that the house should be dealt with only by professionals. That is why we allow volunteers only to clear rubbish,” Terekhova explains. “So far, we have organized 10 such camps involving over 200 people; and we are going to have more. For volunteers from the Saratov Region, this is a way of helping to preserve the cultural heritage of their native area, while for people who come from St. Petersburg and Moscow, it is an expression of their civic position." An important area of work that the Lion House is engaged in is holding adaptation camps for children from children's homes. One such recent event was a Photo Plein Air that brought together children from a Saratov orphanage and local professional photographers. "Any professional psychologist would tell you that simply receiving a visitor at a children's home does not give the kids a sense of their own worth, of being part of an important process. During the master classes, we not only taught them something new but invited them to make something with their own hands that in future will be of use to our museum or will help raise funds for its restoration," Terekhova explains. The idea of public participation in creating a large-scale cultural environment is very close to volunteers and visitors to the Lion House. Terekhova says that all visitors to the museum have an opportunity to hold an event of their own here. The main condition is that the event should have a public significance and be of interest to other people. "My vision for the future of the Lion House is that it will be a platform where anyone can come and put in practice their idea, organize their event. It is important that the event attracts local residents,” Terekhova points out. “For example, just recently I received a proposal to hold a landscape design seminar here; I think that’s interesting." Implementing modern projects requires funding, so the museum pays serious attention and effort to taking part in contests for various grants. 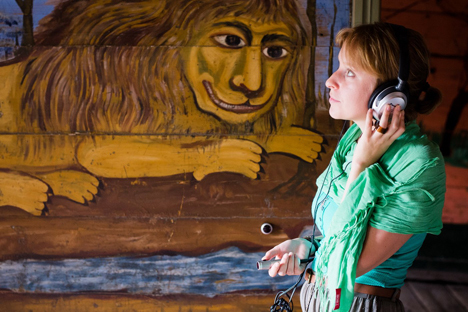 A unique audio guide for use as part of the excursion program was created with a grant from the A Changing Museum in a Changing World contest organized by the Vladimir Potanin Foundation. Recently the museum has won a grant from the Yelena and Gennady Timchenko Charitable Foundation,which will be spent on building a cultural center.